The Idaho House passed a bill Thursday to force school districts to wait to run a “repeat” bond issue. Idaho law requires school districts to win two-thirds voter support for a bond issue to go into debt for long-term projects, such as construction of new schools. Several districts, including East Idaho’s Bonneville Joint School District, have had to run multiple bonds to reach the supermajority threshold. The House was divided on the issue, with some representatives saying the bill may do serious harm to districts facing an emergency, such as a collapsed roof, unsafe facilities or a fire. “It concerns me there is no tie back to emergencies here at all,” said New Plymouth Republican Rep. Ryan Kerby, whose district struggled to pass a bond after a school burned down. Others said the bill goes against local control. But supporters said the bill is intended to honor voter will. “If voters have spoken, maybe the school board needs to listen to that, rework the thing, take a breath, cool off and come up with a better solution — maybe in the next year, not two months later,” said Rep. Ron Nate, R-Rexburg. The bill passed by a thin 37-32 margin. HB 639 next heads to the Senate, where it could be assigned to the State Affairs Committee. During a busy morning floor session Thursday, the House also passed a bill encouraging school districts to offer optional gun safety courses. Nate’s House Bill 443 encourages districts to offer firearms safety courses developed by the Idaho Department of Fish and Game, a law enforcement agency or an advocacy organization such as the National Rifle Association. Nate said the bill is designed to help children learn how to safely handle a gun. His bill provides no funding for schools, which rankled some opponents. “This is not a mandate, but it is a burden,” said Rep. John Gannon, D-Boise. HB 443 passed the House 62-6. It heads to the Senate, where it is likely to be assigned to the Senate Education Committee. The House Education Committee advanced a bill emphasizing free speech rights on college and university campuses. Pushed by Rep. John McCrostie, D-Garden City, and Scott, House Bill 622 is intended to protect students, faculty and visitors alike. “Except as otherwise permitted by the First Amendment to the United States Constitution, no public institution of higher education shall abridge the constitutional freedom of any individual, including enrolled students, faculty and other employees, and invited guests, to speak on campus,” the bill reads, in part. McCrostie said the bill is a response to comments made in September by Attorney General Jeff Sessions, who criticized Boise State University and other colleges and universities for infringing upon free speech rights. Scott suggested the bill sends a message and reminder to colleges and universities. House Bill 622 next heads to the House floor with a recommendation it pass. The House passed a bill to create a new administrator’s certificate for charter school leaders. Midvale Republican Rep. Judy Boyle is pushing House Bill 566, which she said is intended to foster innovation and personalization at public charter schools. If the bill passes, charter administrators would not need to possess a traditional school administrator’s certificate like public school colleagues. In fact, charter administrators wouldn’t need any education or teaching experience to qualify. All they would need is a bachelor’s degree, the ability to pass a background check and complete a three-credit hour course in teacher evaluations. Boyle said it is difficult for charters to find good administrators, and many charter schools have unique needs because they cannot rely on taxpayer funds for building facilities. “As you know, charter schools were designed to be innovative and try different things that regular schools either didn’t want to do, or are not allowed to do,” Boyle said. Rep. Patrick McDonald, R-Boise, said the bill represents only minimum standards, and said charters would not take any action that would harm their schools or students. “My biggest concern is this is watering down the requirements to be an administrator,” McCrostie said. The bill passed 49-18. It heads next to the Senate, where it will likely be assigned to Senate Education. A new bill would require local education unions to more regularly prove they represent a majority of a school district’s educators. Current law requires local education associations or unions prove they represent more than 50 percent of the district’s educators. House Bill 647, pushed by House Education Chairwoman Julie VanOrden, R-Pingree, would force local unions to prove their representation every two years. HB 647 next heads to the House floor with a recommendation it pass. House Education supports sending the Legislature’s interim school funding committee back to work for a third year. The committee passed House Concurrent Resolution 49, which includes an overview of the committee’s recommendations and authorizes the committee to continue their work. Two years ago, the Legislature created the committee to review and possibly recommend changes to Idaho’s complicated school funding formula. In 2017, the committee recommended the state abandon its current attendance-based formula and replace it with a student-centered enrollment model. The committee also recommends the Legislature provide a fifth consecutive year of raises next year for educators under the career ladder salary law. But the committee stopped short of issuing detailed recommendations and a transition plan, which is why Idaho Falls Republican Rep. Wendy Horman wants to see the committee stay on the job. HCR 49 next heads to the House floor with a recommendation it pass. Senate Education honored Chairman Dean Mortimer’s request, and sent his “turnaround schools” bill to the floor for amendments. Mortimer, R-Idaho Falls, said he wants to remove “iron fist” language in favor of an incentives-based approach. As originally written, Senate Bill 1291 would provide expert help to low-performing schools, with a catch. The bill gives the state the power to shut down a school that continues to struggle, even after a three-year turnaround period — or convert a struggling public school into a charter school, or revoke the license for a struggling charter school. Acknowledging that he was “educated” by school stakeholder groups, Mortimer says he wants to strike this punitive language, and make the turnaround program optional. “I’m excited to give it a try,” he said. Funding is an unanswered question. Mortimer suggested a $1.25 million-a-year line item could help seven to nine struggling schools, and said the State Board of Education already has $750,000 a year to work with low-performing schools. But Mortimer isn’t sure the 2018 Legislature will fund an 11th-hour $1.25 million request, and he’s not sure the State Board could shift the $750,000 into his turnaround plan. The committee took no vote and did not debate hiring a $200,000-a-year chief education officer to search for administrative savings in the college and university system. The informal hearing underscored the obvious: The proposal is dead for 2018. Senators heard pitches from Otter education aide Marilyn Whitney and State Board President Linda Clark, who said a CEO could free up money that could go to scholarships or student programs. “We do think there’s the potential for a tremendous amount of savings,” said Clark. Supporters said they would be back in 2019. 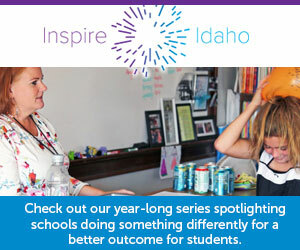 “Our students will be depending on you at that time,” said Rod Gramer, president of Idaho Business for Education. But in 2019, the fate of the proposal will be in the hands of a new governor. And as Idaho Education News reported in January, the leading Republican and Democratic gubernatorial candidates are lukewarm to the idea. Rep. Ron Nate never sought a hearing on the bill proposed by a fourth-grade class, House State Affairs Committee Chairman Tom Loertscher told Betsy Russell of the Spokane Spokesman-Review.